KUALA LUMPUR: Central Malaysian Properties Sdn Bhd (CMP) will be developing high-end condominiums in Johor Baru that may cost about RM1.5mil a unit. Called the “Lido Residences”, it was part of the company’s integrated Lido Boulevard waterfront project and each unit was expected to be about 1,900 sq ft in size, CMP managing director Datuk Chan Tien Ghee said. 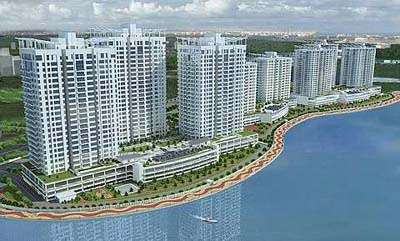 “It (Lido Residences) will comprise 900-odd apartments over a 24-acre estate. The units will be fully furnished and will be facing Johor City as well as Singapore,” he said after a contract signing ceremony between CMP and Jan De Nul (Malaysia) Sdn Bhd yesterday. Apartment units within the area currently were priced RM700 to RM800 per sq ft, Chan said, adding however that CMP had yet to finalise the price of its condominium units. CMP has appointed Belgium-based dredging company Jan De Nul to carry out reclamation works at the site. The deal is worth RM238.6mil. Chan said the works would take 15 months to complete. Once completed, about 94.18 acres would be reclaimed land while 28.17 acres would be on a piled concrete deck. Preliminary works commenced this month. According to CMP’s website, Lido Boulevard spans 2.4km along the Tebrau Straits coastal line. Encompassing an area of 122.35 acres, the project will be divided into six parcels and expected to be completed in 2016. Chan said the project would have a gross development value of over RM4bil. CMP is a special-purpose vehicle set up to undertake the development of the Lido Boulevard project. The company’s main shareholders comprise businessman Tan Sri Vincent Tan Chee Yioun and Chan himself. The project is a joint venture with Johor State Secretary Inc, an investment holding company of the Johor state government, which is also the land owner. CENTRAL Malaysian Properties Sdn Bhd (CMP), a private property developer controlled by Berjaya Group's Tan Sri Vincent Tan Chee Yioun, expects its Lido Boulevard waterfront project in Johor Baru to boast of more than RM4 billion in gross development value (GDV) over five years. CMP will build, among other things, high-end condominiums, hotels, office suites, shopping malls, an indoor snow park, and an art and cultural centre on the 50ha site along the Tebrau Straits. Managing director Datuk Chan Tien Ghee said CMP will start reclamation works next month. The integrated project will stretch from the abandoned Lot 1 shopping mall to the office of the Harbour Master. CMP has hired a private dredging company from the Netherlands, Jan De Nul Group (JND), for the RM238.6 million reclamation job. It will be one of the largest reclamation projects in the country, Chan said after the signing of a contract agreement between CMP and JND in Kuala Lumpur yesterday. 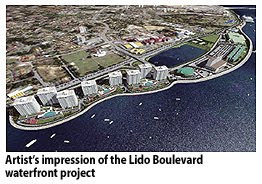 The reclamation will be the first phase of the Lido Boulevard development. Upon completion at the end of next year, 38ha would have been reclaimed. Another 11ha would be on a piled concrete deck. The Lido Boulevard will be split into six parcels, with the high-end condominiums coming under the first. "There will be 900-odd units of high niche condominiums. They will be fully furnished," Chan said. CMP is finalising the prices, but hinted that it could cost at least RM1.5 million for a 1,900sq ft unit. Chan pointed out that new high-end apartments in the area were being sold at RM700-RM800 per sq ft.
Tan is the major shareholder of CMP, while Chan, the Johor royal family and the Johor state government are the other shareholders. JND managing director J.P.J. De Nul expects the reclamation works to be a challenging task, adding, however, that his company had done more challenging jobs in Europe and the Middle East. Among its prestigious international dredging and reclamation jobs are the Palm Island Dubai in the United Arab Emirates, Jurong Island Phase 4 in Singapore, and construction of a wastewater treatment plant in Brussels, Belgium. REHDA (Real Estate and Housing Developers Association Malaysia) Institute, EAROPH (Eastern Regional Organisation for Planning and Human Settlement) Malaysia, and Sime Darby Property is organising Malaysia’s first carbon-neutral real estate conference - Green Solutions Property Conference 2010. Mr Lincoln Lee, Chairman of EAROPH GTi as well as the conference’s organising chairman, feels that the conference and its content are both timely and vital to Malaysia’s current building industry. The conference will be held on April 6 at Sime Darby Convention Centre and will be Malaysia’s first carbon-neutral real estate conference. It will also be included into the Malaysia Book of Records. BEIJING: Two land sales in Beijing have shattered price records and both buyers were state-owned companies, sparking outrage and astonishment at the city's frothy property market, according to Reuters. The soaring land prices came as worries have mounted about a housing bubble in China, though economists said on Tuesday, March 16 that the latest auction prices reflected peculiarities of the Beijing market and did not necessarily point to nationwide trouble. China has tweaked taxes and stiffened mortgage rules in rrcent months to cool housing prices and analysts think it may hold off on further property curbs for a while amid signs that these earlier measures have had some success. But many in the market think the country's third increase this year of banks' required reserves is imminent to counter broader inflationary pressures. A plot of residential land in Dongsheng, a 15-minute drive from the centre of Beijing, was auctioned for 28,000 yuan ($4,100) per square metre, the highest price ever paid in the city -- and just a fraction below the area's average house price. At a separate auction, a 185,000-sq m block of residential land deep in suburbia in Yizhuang went for 5.25 billion yuan ($769 million), the most ever paid in a single land transaction in Beijing. An added wrinkle was that in both cases the buyers were state-owned enterprises (SOEs). China Ordnance Equipment Group Corporation, a military company, bought the Dongsheng land. CITIC Group, the country's largest financial conglomerate and one which is directly led by the State Council, China's cabinet, bought the Yizhuang plot. "The SOEs get even wilder. A crazy day for the Beijing land market" screamed the headline of the Chinese-language 21st Century Business Herald. Private developers have complained that the deck was stacked in favour of state-run firms in Beijing's land auctions because the city required bidders to have registered assets that far outstrip those of some of the biggest listed property companies. Liu Liyong, a research director at E-House China, a leading real estate service company, said state firms benefit from a close relationship with the government as well as vast capital bases. "That's why the SOEs can always win the land auctions," Liu said. Property prices across China rose 10.7 percent in February from a year earlier, though prices have increased far more steeply in certain segments of the market, such as high-end housing in top cities like Beijing and Shanghai. Land prices have been even hotter, more than doubling over the past year. Feng Ke, a finance and property professor at Beijing University, said it was only natural for prices to rocket in the capital. "Land demand far exceeds supply because of the accelerating progress of urbanisation," Feng said. "Besides, the cost for primary developers in preparing a piece of land, including expenses in relocating residents and land clearance, has also increased in recent years, so it is understandable that land can be sold at such a high price." But the country's most successful private property developers have been sidelined in the process. SOHO China, whose avant-garde buildings have made an indelible mark on the centre of Beijing, sat out the auctions. SOHO chairman Pan Shiyi chided Ren Zhiqiang, chairman of Huayuan Property and China's best-paid property tycoon, for his failed bid, saying there was no point in battling against state-backed firms. "Mr. Ren did not listen to me, and paid hundreds of millions of yuan in deposits to participate in the bidding," Pan wrote on his blog. "It is not spending money for land but for shame." Ren replied that he would persevere. Resort, restaurant and retail specialist Bon Ton Sdn Bhd will continue to work with other tourism players in promoting Penang as the choice destination for cultural and heritage tourists. It has invested RM5 million in restoring historic shophouses in George Town's heritage enclave in Penang to date. 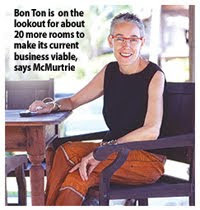 Bon Ton director Narelle McMurtrie said the company's hotel management arm - Brand Bon Ton Sdn Bhd - is looking at managing more heritage properties comprising boutique residences in Penang. "We are now looking at managing other people's heritage properties here by entering into management arrangements with them since we are on the lookout for about 20 more rooms to make our current business viable," she told Business Times. Australian-born McMurtrie, who is synonymous with Langkawi's Bon Ton Resort and the Bon Ton Restaurant in Kuala Lumpur (which has since closed), is now training her eyes on promoting both Langkawi and Penang as destinations to travellers who are in search of rustic-meets-luxury accomodation. Last year, Bon Ton Sdn Bhd acquired 10 shophouses in George Town's heritage enclave along Lebuh Stewart and Lebuh Armenian. The shophouses have been converted into boutique residences, retail outlets and a cafe. In Langkawi, the company has invested some RM12 million where it has been operating Bon Ton Resort since 1994 and more recently, opened a luxury resort called Temple Tree at Pantai Cenang. Temple Tree is made up of a collection of nine antique houses, ranging from ages 70 to 110 years. The homes were destined either for demolition or on the brink of collapse when McMurtrie acquired them from their owners. She then reassembled these homes in Langkawi and rehabilitated them to luxurious resort accomodation with modern amenities. "The Temple Tree project was made possible with assistance from the Ministry of Tourism, which had helped us obtain a loan from the SME Bank," she said. Her Penang properties are all shophouses, which used to serve as homes, warehouses and shops dating as far back as 1850. "We want to offer travellers the 'Penang Experience' by combining the state's rich heritage and food attributes and we are in the midst of preparing a Penang guide to shopping and cafes," McMurtrie said. "By promoting Penang as a destination to travellers, we want to ensure that the state's economy benefits via a spillover effect and that travellers return to Penang and also promote the attractions by word-of-mouth." PETALING JAYA: Talam Corp has entered into an agreement with Menteri Besar Selangor (Inc) last Friday to settle RM241.4mil owing to the latter via disposal of properties and RM12.7mil cash, it told Bursa Malaysia. The settlement is expected to be completed within six months after receiving the approval of Talam shareholders or the redemption of the liabilities by MBI, whichever is later.